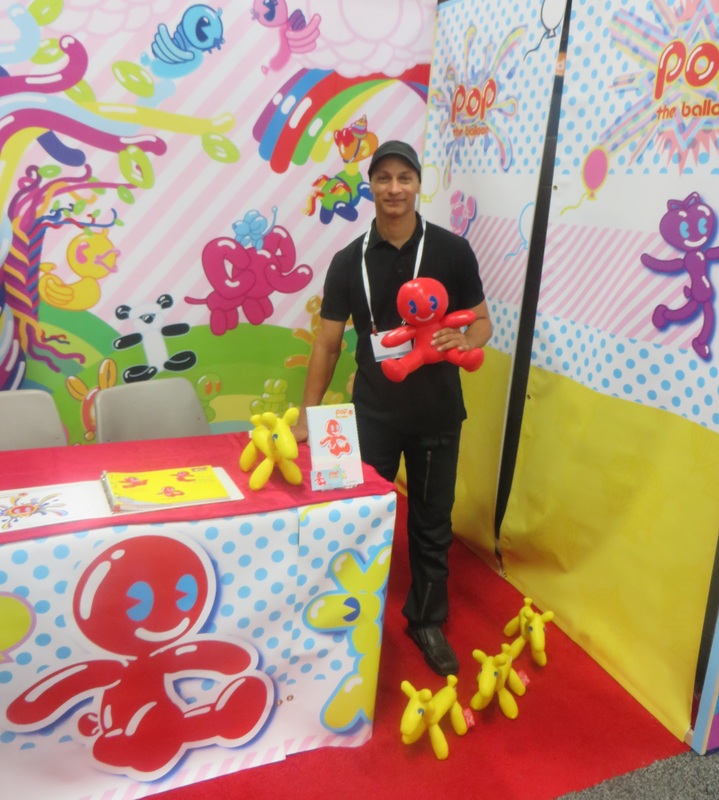 From set-up to break-down, the Licensing Expo delivered on its promise of bringing together worldwide brands, creators, artists, retailers and manufacturers to build business partnerships. We shared information daily from exhibitors and attendees in our blog…both from the Art+Design Zone, but also up-n-coming character properties. Direction at Licensing Expo is so important! I heard from many people, there was plenty of traffic and the leads were excellent. I don’t think Licensing Expo has posted their ‘official’ attendance count yet, but the first day was pretty strong and the second day was even stronger with, of course, the inevitable slower third day. But for the Resource Center it never slowed down. We were still taking appointments even as the Booth was being demolished around us. What a wonderful whirlwind. 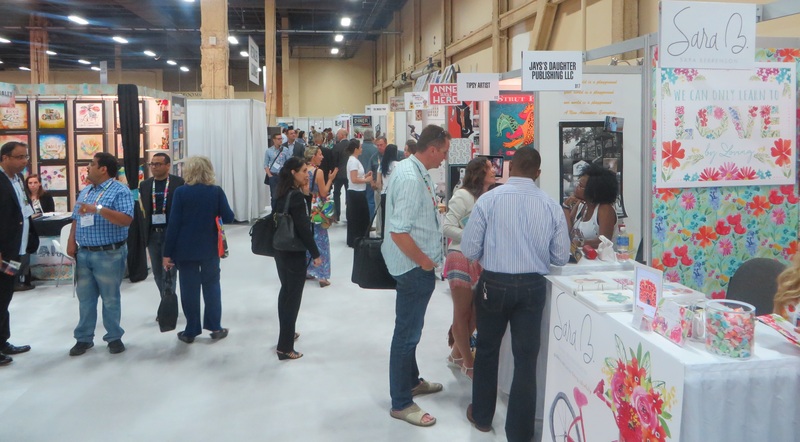 As Licensing Expo’s Art+Design Resource Center, we gave away 30+ free consultations, to exhibitors and attendees alike, as a part of our services. We also gave one of our new video classes and our 80+ free Minicourses to everyone, charged cell phones and laptops, printed urgent papers, and handed out bottled water to the thirsty. Carlos Neville moved from the Art + Design Zone, closer to Characters, with his Pop the Balloon. Everyone participating in the Expo seemed to be very excited about the variety of prospects. While many artists mentioned they couldn’t get meetings with their ‘A’ list potential manufacturers, I heard later that several persistent artists caught their attention and managed to get those exciting appointments after all. 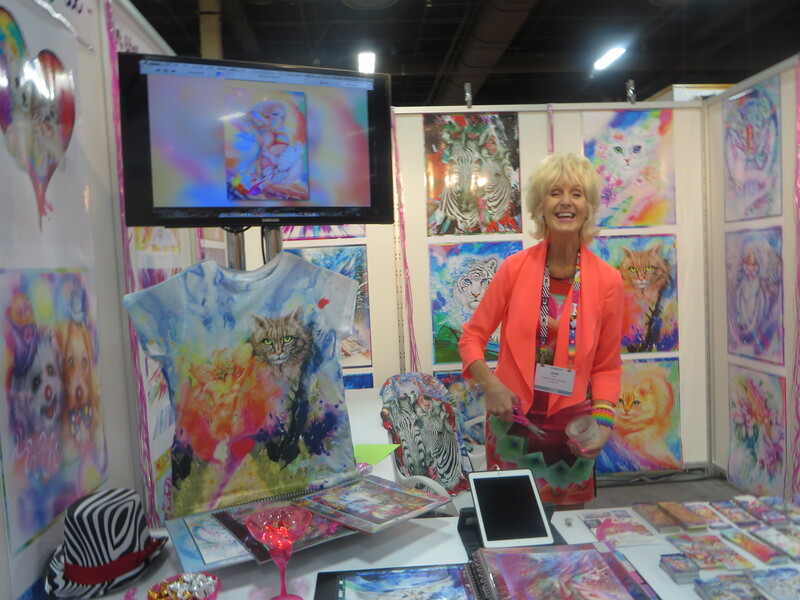 Joan Marie Celebrates Art in her first booth at Licensing Expo. She joins those who will be back in 2016. 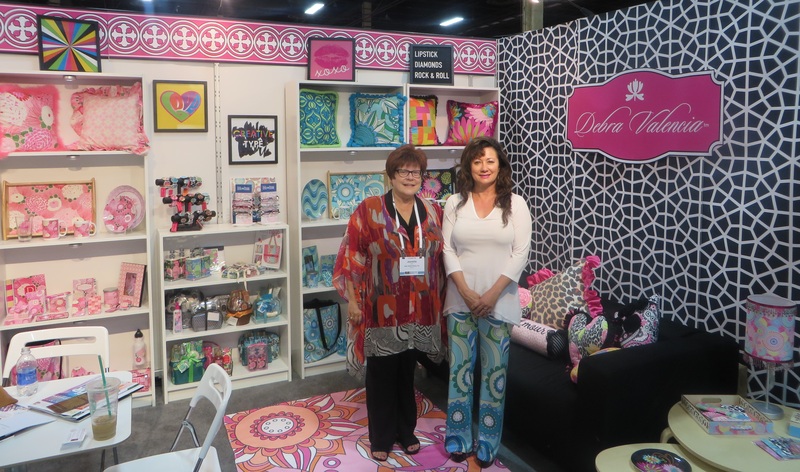 Debra Valencia and I catch up in her beautiful booth, designed as a brand concept store. Engagement is how your audience will choose to interact with you and your brand. Also, who will help bring your products and brands into the limelight. Whether an artist or a property, there is a big trend in utilizing celebrities to increase exposure. Strategic alliances are well and good, as long as you have engagement once the audience grows. While this may not seem relevant to those of you who are new to art licensing, specifically, it does relate. Many new artists are turning to manufacturing some items on their own to develop their ‘following.’ Then online marketing and sales efforts will build your audience and strong sales numbers will absolutely impress manufacturers. It gives you something to leverage. There was also a great deal of chatter about artists, designers and new properties getting high-level leads with companies the exhibitor didn’t expect! Each freely admitted they were in product categories they had never even considered would be interested. 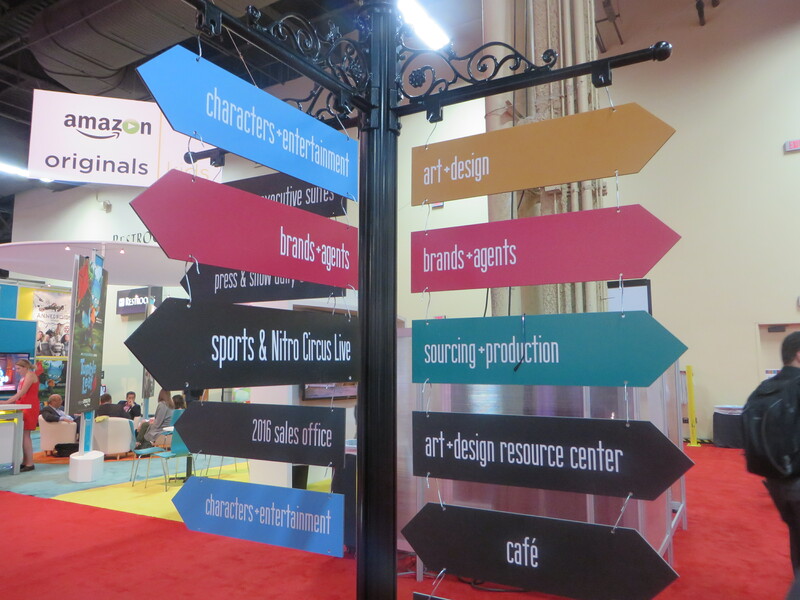 Exposure to so many types of properties and product categories at Licensing Expo is always an eye-opener and fuels broader business goals and plans. Of course I heard complaints too, such as, ‘There is no room for new artists or properties.’ ‘How can we get anywhere when it’s all about the big-guys?’ ‘You need TV before you can do licensing.’ Or ‘You need publishing before you can get TV.’ But I was witness to several artists and properties who made great strides by being well prepared and really understanding what media players and manufacturers would want from a ‘newbie’ in the industry. Let’s see if they can stay the course and keep moving forward. So now the final results for everyone is in the hands of our attention to detail and follow-up. 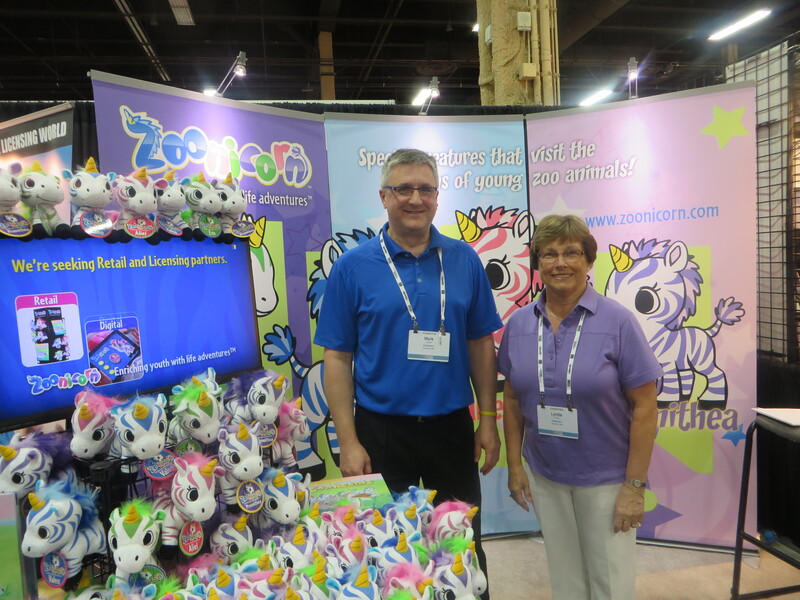 Mark Lubratt and his Mom Linda spoke to many prospective partners about Zoonicorns and will be attending Licensing Expo in 2016. Now everyone has to sort and make decisions about how to follow-up with each and every person they met. We have two classes this week to help you with these processes. One is our FREE Ask J’net Q&A, in which I’ll focus on ‘After the Trade Show Questions.’ Feel free to ask about things: you saw at the Licensing Expo; that maybe didn’t make sense for you as a first-timer; which you are still confused about; and how to make the most of your time there through your strategic follow-up. Ask any questions important to you right now and put them on your registration form. This Ask J’net Q&A is scheduled for Tuesday, June 16th at 10:00 am PDT / 1:00 pm EDT (you will receive your Classroom Access Information at least one-hour before the class). Register Here. You won’t want to miss Sales & Trade Show Follow-Through Techniques. on Thursday, June 18th at 10:00 am PDT / 1:00 pm EDT. This live phone event will be 1.5 hours and the cost is $75. After your purchase, you can attend live or after the event you will receive … an audio (MP3) file, 60+ page PowerPoint presentation (PDF format) and video link to watch the entire class at your convenience. We know everyone has a different way of learning, so we offer more ways to learn than other training events in the licensing industry. This class has 3 parts which cover the 1) Organization of your follow-up, how exactly to 2) Follow Through carefully and accurately on your leads and 3) Sales Techniques that will close the deal and grow your business. You may place your questions on the registration form, and they will be answered during the live event. The training will focus on characteristics of licensing sales which you won’t find in a traditional sales class. You will receive your Classroom Access information the evening before the class, June 17th, via email. Register Here. Hope you can join me for one or both of the classes this week! Please share all this information with those who might want to attend the Expo next year or learn about our business. Thanks. 5. Prepare press releases before AND after the show – This is one of the times you really need to reach out and share your business news and information. Publicity, such as those mentions or articles in magazines, blogs, newspapers, trade publications, are often more credible, believable and profitable than other types of exposure. Before the show it’s important to make sure everyone knows you will be attending, where to find you, and what you have to offer. After the show, it’s time to share the news about your accomplishments and executed deals. 4. Create a promo video – Videos are one of the most powerful and persuasive marketing tools available today. Keep in mind that a moving presentation overview draws in prospective clients, but be sure to share with them with your more detailed follow-up material when it comes to your one-on-one meetings. Try to format your videos for as many different platforms as possible. Videos can be used on booth monitors and on tablets and smartphones for impromptu presentations outside your booth, as well as in online public relations and for social media exposure. If you have a property that lends itself to an interactive demo, then go for it. By giving attendees something to do, it gives you more time to interact and discuss their needs. As you can see, your promotional videos will take on a variety of formats for different purposes. By organizing the goals and needs clearly before creating the videos, you can economize on the development of your materials. 3. Take time away from the booth – This takes preparation because you need the staffing to cover you when you step away, as well as to decide how to use your precious time. Get clear on your priorities so you can visit booths of prime prospects and competitors first. Make friends with your neighbors and take time to attend sessions where your prospects are speaking or might attend. And in general, talk to everyone to meet new people and make new friends. Whether in line for coffee, lunch, the restroom, or sitting at a training session or on the escalator…talk to the people around you. This is really the best way to take full advantage of your networking opportunities. Someone you struck up a conversation with is much more likely to stop when passing your booth on the show floor—and even if they aren’t a prospect, you never know WHO THEY KNOW. Once you have accomplished your goals, definitely take time to roam and get inspired by ideas and connections that hadn’t yet occurred to you. 2. Ask for what you are looking for – While many people might consider it too forward or rude, you will not get what you want if you don’t ask for it. This is what separates the effective business people from the ineffective ones. Write down exactly what it is you want your new contacts to know and what you are asking them to do. Make sure you relay it often and to everyone in a professional way. Again, be assertive, not aggressive. If you are unclear with yourself about what you want others to do, they will not know how to help you even when they are willing. Practice your points until you have them memorized. 1. What do YOU have to offer – This seems like a very obvious instruction, but you would be surprised how few people actually express clearly what they are offering. Remember that industry events, especially trade shows, are jam-packed with influential and busy individuals. You want to talk with everyone you can. Because you never know if they have the means to help your business in a variety of ways. And remember, common courtesy goes a long ways! You may not be as well-known as many of these folks, but you are important too. You need to be very clear about what you have to offer, so that you know exactly what you bring to the relationship. Conversations with high-ranking execs will go must smoother when you know exactly what you have to offer them. It’s important to have a realistic and dynamic vision of what you bring to the table, so that moving forward you aren’t wasting anyone’s time, including your own. There is still time to register for ‘Marketing Your Art, Characters, Designs & New Brands through Trade Shows,‘ which begins today at 10 a.m. PDT. If you can’t attend today, you will receive an MP3 audio file and 80-page PowerPoint presentation at the conclusion of the class. For more information and to register click here. Note: This article ran originally in the Licensing Expo Newsletter. 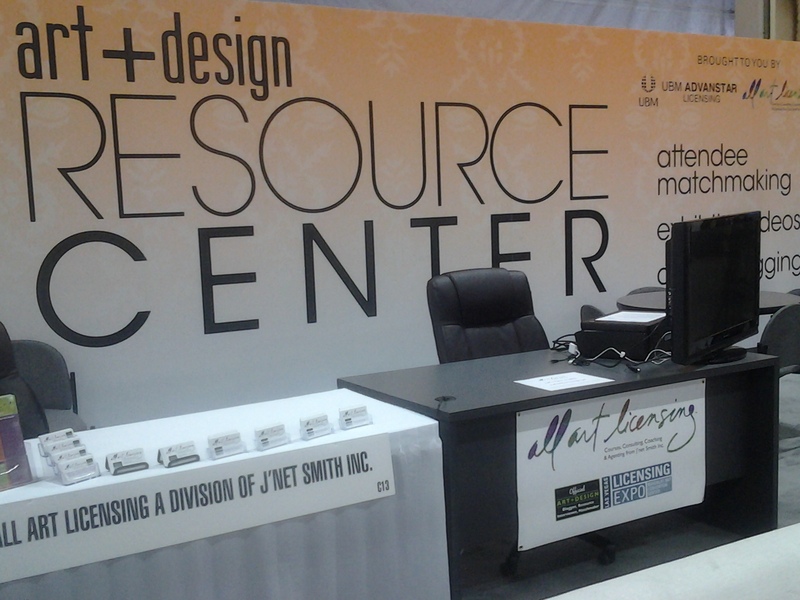 All Art Licensing will be available at the Resource Center in the Art + Design zone Booth #C-13 where I will be reporting on deals and events, assisting attendees in navigation of the trade show, providing free expert licensing advice and supporting the Art + Design category exhibitors. Hope to see you there! Is the snow getting you down? Join our Free Ask J’net Q&A next week and in March for some ‘hot’ answers to your most pressing art marketing and licensing questions. Below is our Spring line-up of classes, part of the Worldwide Creators’ Intensive series. Next time my blog will focus on ‘Shopping Docs’…something all art licensors and artists should absolutely know about and use…so stay tuned for an information packed blog tomorrow (and a PDF example). Meanwhile, share this with your friends and colleagues, peruse the courses and register ASAP to get your questions answered in all the classes! This one-hour class is a ‘live’ phone event, where you provide the questions about art, design & character licensing and J’net provides the answers. When registering online, just write your question at the bottom of the form. J’net will answer as many questions as possible during the hour, all you need to do is call in at the specific time to get answers to your questions and learn from others’ questions. Please note: You will receive your Dial-in number and Access Code for the class the night before the event from All Art Licensing. This is not an 800 number, so your standard long distance fees will apply. This class will include a live audio and full PowerPoint presentation. However, if you cannot make the scheduled event time, we will be sending the full class (BOTH the audio and PowerPoint) to all registrants the following day. When you sign up, include any questions you would like answered at the bottom of your registration form and J’net will cover as many as possible during the class. Please note: You will receive Dial-in number and Access Code for the class the night before the event, as well as a link so you can download the presentation, from All Art Licensing. This is not an 800 number, so your standard long distance fees will apply. This course is an introduction to character licensing for cartoonists, animators and illustrators. A lot of creators ask: “What can I do with my characters?” This class will show you some very practical and useful answers to this question. In this course, we will explore character licensing from the beginning first steps to the first signed contract. This class will teach you how to design characters to enhance their licensing potential, create exposure, leverage business opportunities, know when you are ready to license products and choose the product categories which are best for your characters. We will also cover the most important things to watch for and avoid. If you are more inclined to create characters, than designs, then this is the right class for you. Your characters make sense to you…now let me help you make sure they will appeal to the broadest possible audience. With the right industry knowledge and strategic thinking, you can learn how to share them with the world. This 2-hour class will include a live audio and full PowerPoint presentation. However, if you cannot make the scheduled event time, we will be sending the full class (BOTH the audio and PowerPoint) to all registrants the following day. When you sign up, include any questions you would like answered at the bottom of your registration form and J’net will cover as many as possible during the class. Fall is in the air and business is growing for those of us who are actively marketing our products and services. Don’t wait until the New Year to assess how your business has done this year. No matter how you want to approach it—dollar revenue, number of deals, number of new and existing clients or products—taking a tally gives you an invaluable perspective on marketing your business. Marketing your business is absolutely crucial. It also may be simpler than you think if you keep focused. One of the key marketing factors that I find new, and even experienced, art licensors get wrong or completely overlook is their target audience. Reach out to your target audience and communicate with them effectively. Learn how you turn the target audience from prospects into sales, customers, fans, etc. Know if you have reached the audience and have been successful (whatever that is for you). Repeat 3, 4 & 5. So, ‘how do you decide your target audience?’ This step will influence how your time is spent and nearly every aspect of your business every day, hereafter. First of all, most entrepreneurs have more than one target audience—a business-to-consumer (B2C) and business-to-business (B2B) target. Who does your painting, art, graphic design, cartoon, writing or other creative work appeal to in the marketplace? Be specific as possible. What types of product or media should carry your ‘creative’ to consumers? Your answer will depend on the desires, interests, lifestyles and purchase habits of your audience(s). Please don’t fall into the ‘everyone loves my art/design/photography/character’ trap. I often hear creators declare that their creation appeals to everyone…but to be honest, it probably doesn’t. So get real. Narrow it down to a primary and secondary, identifiable and reachable, audience segment. Then to achieve your business goals, and to reach your audience(s), ask yourself whose assistance in the ‘business’ marketplace do you need. This will identify your B2B target audience, and it will vary greatly depending on your goals. 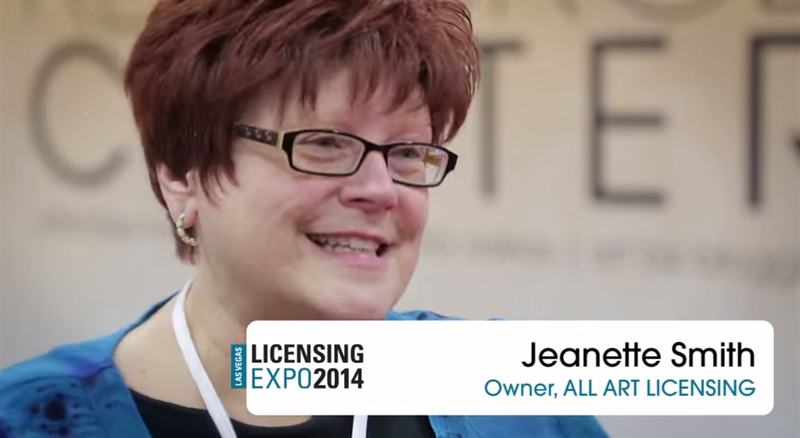 Licensees—who do you want to license your art, property or brand? These are the manufacturers of all the worlds’ products that could sign a licensing deal to produce your creative on their product and wholesale it to retailers. Agents—if you are looking to sign on with an agent, then they are an important target audience for you to woo. Do you need a licensing agent, literary agent, illustration rep, gallery agent or another specialized kind of manager/salesperson/marketer? Retailers—do you want to go directly to retailers and offer them an exclusive licensing or purchase opportunity with your art, designs or brand? Trade Media (magazines, web sites, newsletters and more)—these are the media channels where you reach the other businesses, the licensees, agents, and retailers, for example, to make them aware of your business. Consumer Press (magazines, television, radio, websites, newsletters, promotions and more)—the media channels to reach your customers and potential customer to make them aware of your creativity and brand. Now that I’ve got you thinking about the target audiences related to your business, go back and see if your web site, brochures, presentations, logo, trade booths—and all those critical branding elements—are making the impression you want on the businesses you must reach and influence to close sales. And ask yourself if the products that are being licensed or produced are the best designs and quality you can get into the marketplace for your valued customers. I’m back with an ‘Awesome October’ of classes scheduled and wanted to share it with you today. 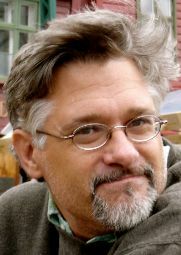 If you have animation, television, movie and product licensing dreams for your character concepts then this is your chance to learn from a fantastic businessman, creative dude and teacher, Michael Fry, who co-created Over the Hedge (with partner T.Lewis). Michael and I are joining forces to teach ‘Building Character: How to Cash In On Your Characters Without Losing Your Soul. ’ This is the first webinar in All Art Licensing’s Worldwide Creators’ Intensive Series for Fall 2012/Winter 2013. These courses are designed to bring top names, highly qualified speakers, to creators around the globe. We will specialize in providing detailed, immediately useful, information at a price nearly any artist can afford. These are always online events (webinars) so you can attend from anywhere, ask questions, and download the course and presentation soon after the live event for further study. You never need to worry about missing one spec of valuable information. And of course, it’s time for another Free Friday, Ask J’net Q&A, so read on…there is something here for everyone. Join me for our next, wildly popular Q&A class, where you have the opportunity to tap into my knowledge, experience and brainpower. This one hour class is a ‘live’ phone event where you provide the questions and I provide the answers – for FREE! Below I’ve listed just a fraction of the questions I’ve answered over the years. So sign-up today and don’t forget to send in your questions on your registration form! How do you organize a licensor’s web site to appeal to manufacturers? As an artist, do I need a blog? How risky is it to do spec work? When signing licensing deals, should a press release be done for each company? If I don’t like doing borders and patterns, can I just do stand alone images? What are the traits to look for in a good manufacturing partner? What design and theme trends will be seen on product this year? How do I get started in art licensing? What would be the first 5 questions I ask a manufacturer, if they express interest in using my artwork for licensing? How do I negotiate a royalty with a major manufacturer that wants to pay a flat fee? A great class for those thinking about or entering the art licensing field. Learn about how art licensing works in this live webinar — which is FREE for Graphic Artists Guild Members. It will cover the fundamentals of art licensing and provide insights to help you determine where you fit into this business. I will teach the art licensing process, timelines, today’s artist requirements and challenges that are to be expected, as well as valuable information on retailers, the agent/artist relationship, and much more. If you are already a ‘Guild’ member, you can sign up on their site for free, or become a member to take advantage of other benefits and then register. All registration for this event is being graciously handled by the Graphic Artists Guild. Awesome-thank you! Register here. They say content is king. But the truth is that viewers and readers fall in love with characters, not content. Whether it’s a novel, graphic novel, comic strip, web comic or web animation, characters are what attract loyal fans and licensors. Audiences want to own and share a piece of what they love, whether it’s a T-shirt, a plush toy or a major motion picture. But how do you get your character from the page or screen to the store or theater? Build an audience and licensors will come, right? Yes, that’s part of it. But there’s more — a lot more to making sure your characters get the best shot at becoming household names. 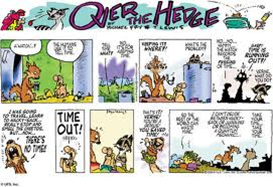 Please join the co-creator and writer of the Over the Hedge comic strip, Michael Fry, and I for a 6 hour webinar held over three-days that will guide you through the intersection between art and commerce to best develop and market your characters to their maximum potential. The live seminar includes an extensive downloadable audio and PowerPoint presentation that outlines each step in the process from creation, publication and brand building to promotion and licensing for television and film. You can learn more, register or see the daily schedule for Building Character online or click here for a printed version of our Worldwide Creators’ Intensives for Fall 2012/Winter 2013. Product development and design go hand in hand. As an art licensor, you’re creating a piece of art that potentially could be featured on hundreds of thousands, or millions of products. Art licensing is a highly competitive and commercial business, and as it’s growing, the competition is becoming stiffer. It’s really more about creating product lines and product options for manufacturers. Your target audience is most often manufacturers, who become your licensees. Manufacturers are selling to the retailers, who make the final decision to put licensed product on store shelves, thereby making your art available to consumers. So, if you really think about it, what you are doing is creating the design elements, which the manufacturers will place on their product. Then you’re selling the manufacturers on the idea of using your art to help grow and build their product’s exposure, their sales, and profits from retailers. While I think most manufacturers would love to design their own products, but in today’s economy they just don’t have the time or staff. They’ve been impacted deeply by the economy and controlling costs has resulted in very lean product development, production and design staffs. These manufacturers are depending on artists and designers more than ever to fulfill their creative needs; design their individual products, as well as complete product lines. As an art licensor, you’re not creating one image to be sold as one image; you’re creating multiple images that create a collection, which will be marketed to manufacturers for small and large product lines. The manufacturer may create the product line, or you may be very influential in creating the product line. But the bottom line is that you want to reach those manufacturers, and team up with them to get your art on product. This means your art must be mocked up on illustrations of products, or product templates such as those available from All Art Licensing, to actually show how your art would appear and how you wish to have it produced. It’s crucial to go this extra step so the manufacturers can envision your art on their products. Manufacturers want you to present to them the plate with the design on it, the mug with the design on it, the tablecloth with the design on it. Are you envisioning your art askew in a corner, or centered with a traditional border? What’s your vision for your art, and for your art designed on the manufacturer’s product? Let them know! Here’s your chance to show off your ability to design products in your key licensing product categories. Make sure you keep your product design relevant. Don’t mock up your art on an apron if you want to pitch infant wear. Your presentations need to be designed for the manufacturers you’re pitching. So, make sure you have a clear vision to whom you’re sending the presentation out, and think about how to design your art on their product for them. Prepare to be an entrepreneur. Start your art licensing business by reading about and talking to successful entrepreneurs in all kinds of businesses. Most successful entrepreneurs are happy to share what they’ve learned—the good and the bad. Ask yourself if you are ready to be an entrepreneur with all the ‘hats’ you need to wear on a daily basis. Creating and growing residual income requires a balancing act. You’ll be continually creating art to keep your portfolio fresh, maintaining a large library of art to hold manufacturers’ interest, and thinking of new ideas for your art, whether on the cutting edge of trends or on-trend. And art development is just one end of the spectrum. On the other end of the spectrum, your responsibilities as a business owner also demand time. Time is spent to manage finances, schedules, deadlines, contracts, clients, approvals, annual plans, marketing, budgets and staying informed on industry news. So, the entrepreneurial business model means you’re constantly marketing your art and product design, creating new art, running your business, and staying motivated. All of those things require a balancing act of skills, time and attention. I want to clarify that even if you having an agent, you are still an entrepreneur and will have to manage a juggling act. Think about it, you don’t just hand over your business to an agent. There’s a distinctive hat you wear when you search, hire and work with your agent. And if you don’t take the time to ‘manage’ your agent, things can go awry. Be honest with yourself about areas where your skills excel and where they are lacking. 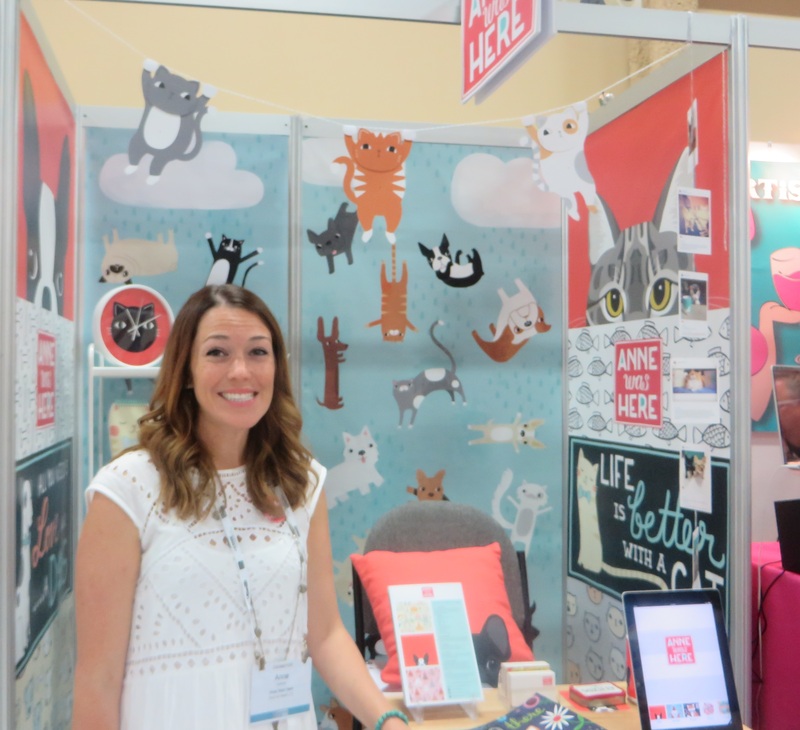 All types of entrepreneurial skills are a must for the success of your art licensing business. Try reading some business blogs as a part of your ongoing training, such as Alyson Stanfield’s Art Biz Blog. I’d like to hear what other business blogs you find helpful, so I can share them with everyone.